With interest rates still hovering around all-time lows and investment home prices rising steadily over the past several years, leveraged deals are increasingly attractive for buyers attempting to maximize returns. The recent increase in prices has also moved some cash buyers to the sidelines, reducing the hyper-competitiveness in the market. Nonetheless, activity remains robust and investors need to be selective and target a broader geographical area to find quality deals. 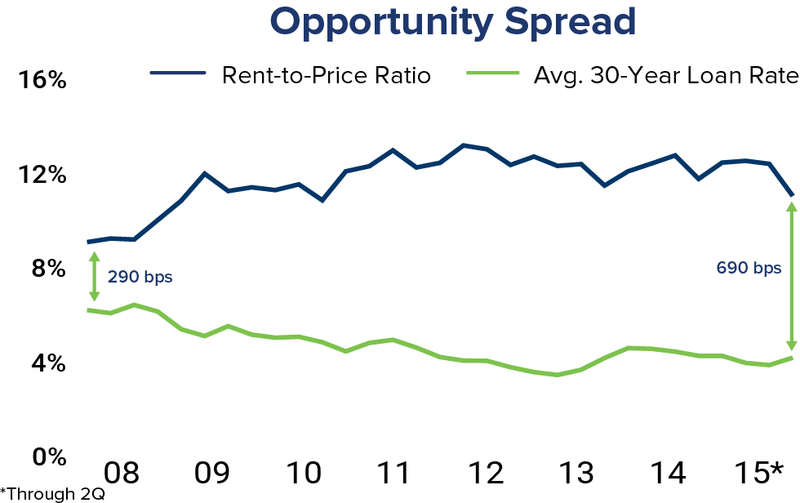 The Opportunity Spread, or difference between the rent-to-price ratio and average 30-year mortgage rates, was 690 basis points in the second quarter, 400 basis points above the spread at the end of 2007, when the market entered the Great Recession. In mid- 2012, the spread peaked at 910 basis points as pricing, financing and rents created the most favorable investment climate. In other words, the investment housing market is closer to the best time to buy than the worst. When the Fed begins to normalize rates, which could happen by the end of 2015, the Opportunity Spread may begin to tighten. 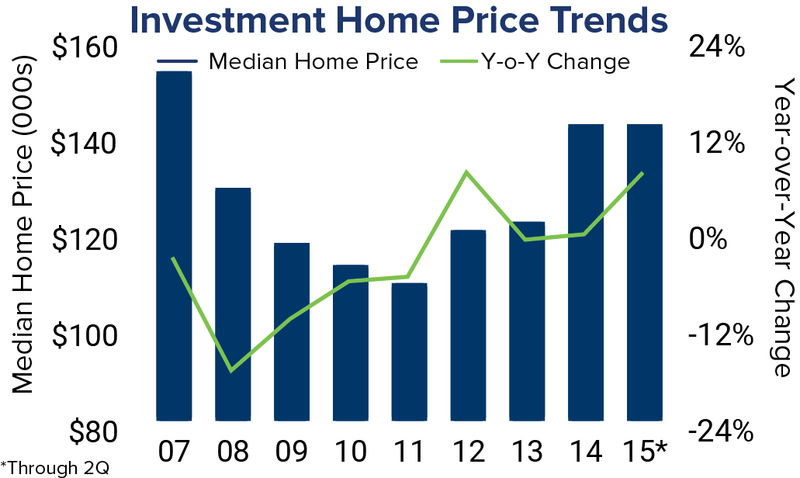 In the second quarter, the median price for an investment home was $150,000, up 11 percent from the same period last year. Prices peaked at $176,900 in mid-2006. Historically, wider spreads between the rent-to-price ratio and the 30-year mortgage rate have signaled strong buy periods. In the second quarter, the national Opportunity Spread was a healthy 690 basis points. Nationally, average gross rental yields were 10.9 percent in the second quarter, down 80 basis points from the same period in 2014. 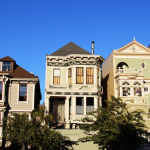 The decrease in average yields emerged as prices climbed more quickly than rents. Typically, professionally managed properties require a gross rental yield near 7 percent to reach profitability. Ohio claims the highest yields in the nation, including five of the top six markets. 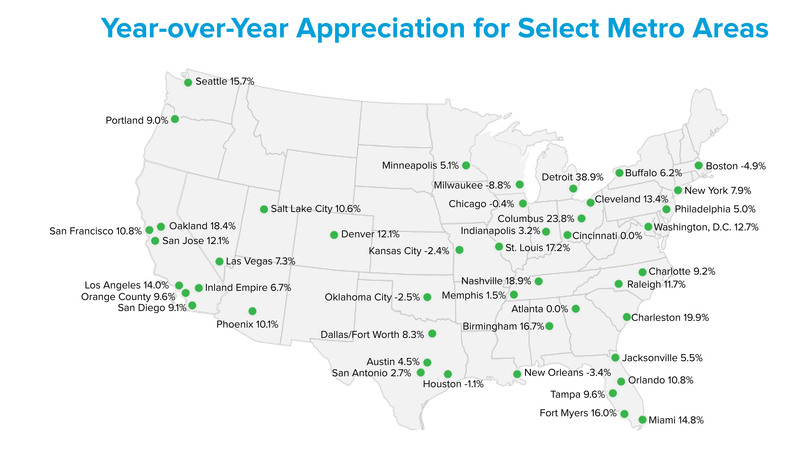 Pittsburgh also appears in the top five after average yields climbed 440 basis points in the past 12 months, representing the largest increase in the nation. At the other end of the spectrum, San Francisco has the lowest gross rental yield at 5.0 percent, followed by San Jose at 5.5 percent. Four other California metros are among the 10 lowest-yielding areas in the country. At midyear, seven markets recorded average yields below 7 percent, though much of the nation’s wealth is within these markets. As a result, investors are moving capital away from their home areas and into secondary metros to maximize returns. High prices in most coastal states encouraged investors to explore opportunities in secondary markets. As a result, the top- 10 metros in terms of investment price appreciation include five Heartland markets ranging from the Rust Belt to the Bible Belt. Florida also claims four metros in terms of appreciation as retirees purchased second homes and investors moved back into the single-family and condominium markets. 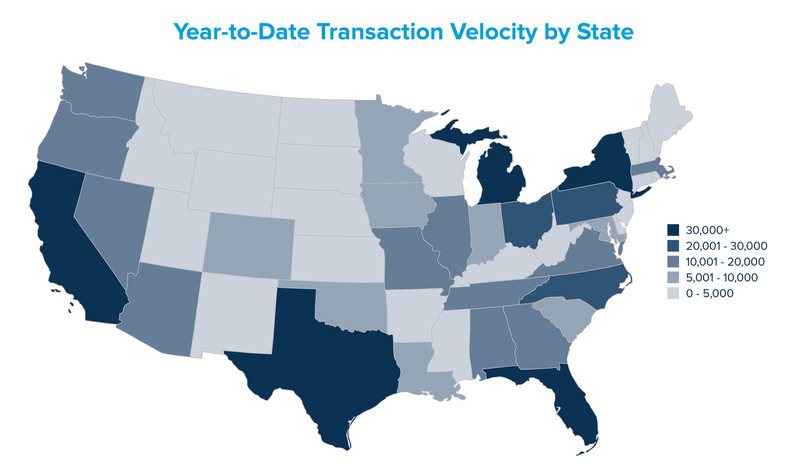 The South dominated the year-over-year increase in transaction velocity. Boston, Mass. and Portland, Maine also generated buyer interest, while Honolulu experienced a surge due to vacation home acquisitions. Two Florida metros complete the top-10 metros with the highest jump in the number of investment sales. 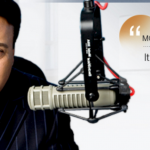 Sources: HomeUnion® Research Services, Axiometrics Inc., Freddie Mac. Investment sales defined as transactions with absentee owners based on tax records and includes single-family homes and condominiums that can serve as traditional investment properties, vacation homes or second homes. Median prices are based on 375,000 investment transactions in the second quarter of 2015. The Opportunity Spread is derived from the ration between second quarter rent and price, compared to the second quarter average 30-mortgage rate reported by Freddie Mac. Disclaimer: Information has been obtained through our research and from sources believed to be reliable, but no representation or warranty is made, expressed or implied, with respect to the fairness, correctness, accuracy, reasonableness or completeness of the information and opinions. Additionally, there is no obligation to update, modify or amend the materials contained herein or to otherwise notify a reader in the event that any matter stated herein, or any opinion, projection, forecast or estimate set forth herein, changes or subsequently becomes inaccurate.